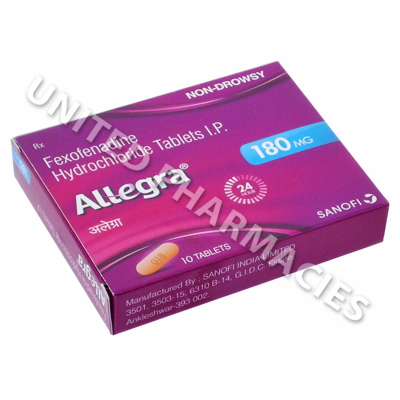 Allegra (Fexofenadine HCL) is an antihistamine which works by providing relief from seasonal allergies (hay fever). Its mode of action is working as an antagonist of the histamine H1 receptors, which helps stop the release of allergy chemicals and can also prevent the increase in blood flow to the affected area that occurs as part of an allergic reaction. Allegra (Fexofenadine HCL) is an antihistamine which works by providing relief from seasonal allergies (hay fever). Its mode of action is working as an antagonist of the histamine H1 receptors, which helps stop the release of allergy chemicals and can also prevent the increase in blood flow to the affected area that occurs as part of an allergic reaction. The main ingredient in this medicine is frequently referred to as a third generation antihistamine, and is said to differ from older antihistamines due to its non drowsy formulation, which is as a result of it not crossing the blood-brain barrier. This minimizes sedation. Symptoms of seasonal allergic rhinitis can include a blocked nose, rhinorrhoea (runny nose), frequent sneezing, itchiness affecting the throat, nose and eyes, watering of the eyes and redness which affects the eyes. Use of this medicine can effectively relieve all of these symptoms, and this leads to a significant reduction in the disruption and discomfort caused by allergies to pollen, dust or any other substance that can trigger symptoms. Doctors may sometimes recommend the use of this medicine for chronic idiopathic urticaria. 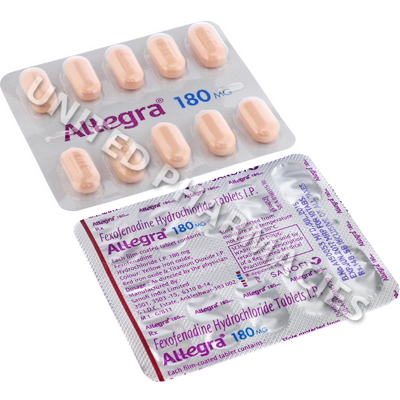 Allegra (Fexofenadine HCL) comes in the form of 180mg strength tablets which are taken orally. The required daily dosage will be decided upon by your doctor, and it is common for adult patients treating hayfever to be instructed by their doctor to take 1 tablet per day. Hives (chronic idiopathic urticaria) is also treated with the same dosage. However, there is also a possibility that your doctor will recommend a different dosage schedule to those listed here. Therefore, it is very important that you pay close attention to the directions of your doctor, and only take the amount you are supposed to take. If any side effects are noticed during treatment, tell your doctor. You will require immediate hospital treatment or medical care if you suffer from chills, aching all over the body, fever or any other serious side effects which have not been listed in this paragraph. Consumption of fruit juices could cause absorption of the medicine by your body to be more difficult. Your doctor may avoid taking these tablets alongside fruit juice. Although this medicine is considerably less likely to produce a drowsy effect, it is still necessary to note that some patients might react differently and experience sleepiness. Do not drive or use machinery if this happens. Always use Allegra (Fexofenadine HCL) as you have been prescribed by your doctor. Never self-medicate or change your dosage without first consulting your doctor. The correct dosage can vary depending on your health, medical history, and the severity of the condition being treated.